A baby is found abandoned and shortly thereafter the mom is found murdered nearby. The first task for the police is to find out who the child and woman are, which turns out to be a difficult task since no one seems to miss them. We also get to follow a three-year-old girl who has been left home alone. The days pass and she is finally able to get in contact with the outside world. The police also get another murder case to investigate when a teenage girl is found murdered on a ferry. Her sister is battling her own issues and the fact that their mom is an alcoholic does not make it easier. 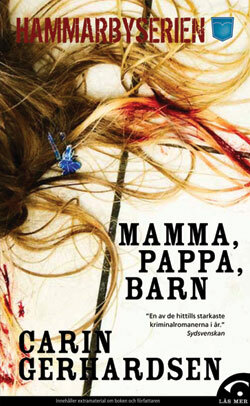 The Cinderella Girl (Swedish title: Mamma, Pappa, Barn) is the second part of the Hammarby series. This novel is better than the first part The Gingerbread House (Pepparkakshuset). The graphic descriptions found in the first part are missing (thankfully). The second novel is also much more exciting and almost impossible to put down. There is also a continuation of the sidetrack from the first novel (a policewoman who was raped), but we do not find out how it ends this time either and I assume the author will continue this track in the next novel as well.